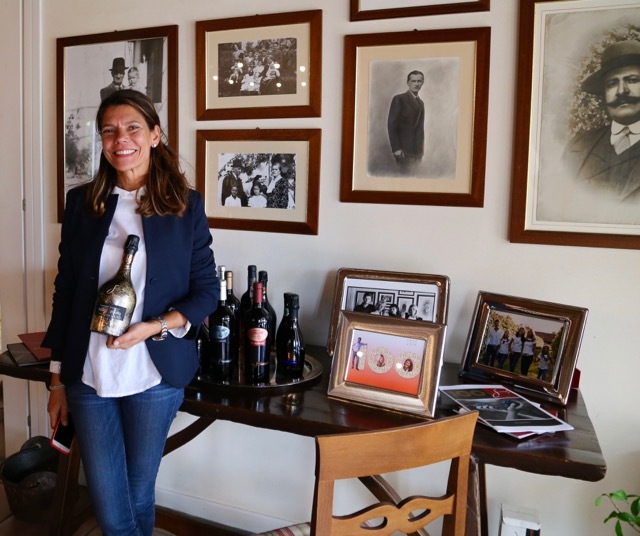 It’s lunchtime at the San Simone winery – a homey spread of cheesy mushroom and spinach pastas – and the Brisotto sisters, fourth-generation vintners, are explaining the everyday appeal of Prosecco. A good bottle, they say, is like a good pair of jeans, fuss-free style that goes with everything. True enough, but that’s not to say Prosecco producers aren’t sending some fairly premium denim to market these days. From tarter and leaner taste profiles to push-the-envelope Prosecco col fòndo with its distinctive, briny bite, producers are showing there’s a lot more to this category than simple and sweet. Here are a few wines I discovered during a recent trip to the Prosecco DOC, a region covering about 50,000 acres in the Veneto and the Friuli Venezia Giulia regions. Floral, fruity and teeming with foamy bubbles, Prosecco has been taking America by storm. Nielsen figures from last year showed that Prosecco was growing faster than sparkling wine sales overall – 36% for the Italian bubbly vs. a 10% rise for all sparklers. But while many may think of Prosecco as primarily slightly sweet – and nothing wrong with that – there are other styles available. 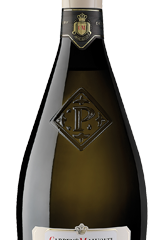 At San Simone, the Brisottos – Anna, Chiara and brother Antonio, the winemaker – produce Perlae Naonis Millesimato 2014 a brut-style Prosecco that delivered a juicy mouthful of sweet-tart apple pulled together with a citrus finish. From Bosco del Merlo, the Millesimato DOC Brut 2015 was fresh and lively with a mix of Granny Smith apple, peaches, and a touch of pear for sweetness. And the La Tordera Brunei Brut Valdobbiadene Superiore Prosecco, was light and airy with white flower aromas, lots of pear and a pleasant finish of honey spritzed with lemon. 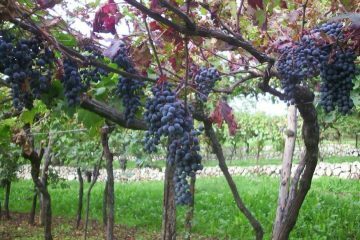 In addition to Prosecco DOC, Prosecco country has two other appellations, Prosecco Superiore Conegliano-Valdobbiadene DOCG and Prosecco Superiore Asolo DOCG. Each has its own set of regulations and covers a specific geographic area. Within the Conegliano Valdobbiadene DOCG lie 43 “rives” – vineyards on steep slopes where grapes are hand-picked and yields are lower – 13 tons per hectare (about 2.5 acres) vs. 13.5 for the DOCG as a whole. 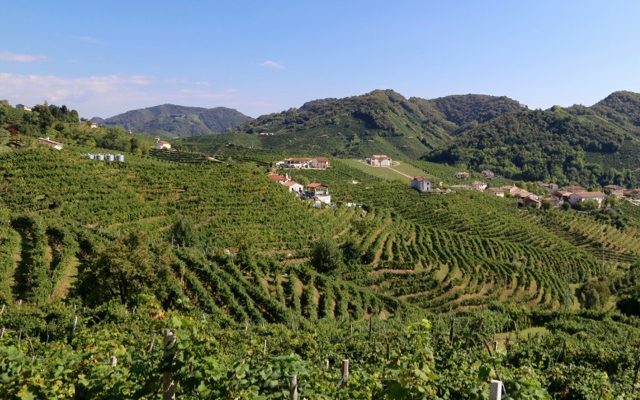 The most famous “rive” is Cartizze, a subzone of Valdobbiadene which is considered the “grand cru” of Prosecco and has a yield limit of 12 tons/hectare. Although you can find brut Cartizze, the traditional sweeter styles still prevail. A good example is Villa Sandi’s Vigna La Rivetta Cartizze, a very gentle wine that tasted like a mouthful of delicate lemon mousse infused with apple cider. Like Champagne, Prosecco gets its bubbles from a second fermentation. A base still wine is made and then a dose of yeast and, usually, sugar added. The yeast eats the sugar, creating carbon dioxide that can’t escape and turns into bubbles. In Champagne and other sparkling wines this takes place in the bottle, known as classic method. With Prosecco, it happens in stainless steel tanks and is known by various names including Charmat or Italian method. But before tank technology came in, Prosecco used to get its second fermentation in the bottle. In classic method the spent yeast (lees) are removed, but in Italy they were left in, creating a cloudy, slightly salty wine with fewer bubbles. With its diverse styles and inviting price point, Prosecco begs to be explored. But don’t, says Anna Brisotto, think of it as cut-rate Champagne. Democracy and blue jeans? Sounds like quite a pairing.